An important part of our program is promoting mental health and well-being among infants, young children, parents and staff. It is our goal to minimize the impact of stress and trauma as a way to prevent more significant mental health issues from developing. When issues do arise, our program offers specialized support and intervention by highly trained licensed or licensed-eligible mental health professionals who specialize in working with families and caregivers of infants and young children. The earlier we can intervene, the greater the impact and hope of minimizing more significant mental health issues later. Our Mental Health Consultants visit classrooms on a regular basis to offer support to teachers in creating a healthy social and emotional space for children to learn and grow. Our Mental Health Consultants also meet with parents and other caregivers to support positive, nurturing relationships between infants, very young children and the important adults in their lives. Our Mental Health Consultants provide referrals for relationship-focused family therapy as needed. Our Mental Health Consultants provide annual mental health screenings on each child to ensure we give special attention to any child who may be struggling socially or emotionally. Conflict is an opportunity to teach. We view parents as the experts on their children and our goal is to partner with them to promote well-being. Parenting can be challenging and having support can be helpful in understanding challenging behavior and how to respond. 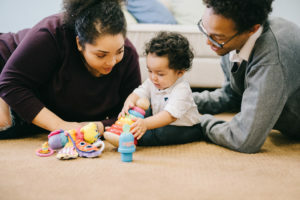 Relationships are important to development in the earliest years and our individual and group support can help reduce challenging behavior by improving connection and understanding what behavior is communicating. To learn more about infant mental health, click here.